FILE - Britain's Parliament buildings in London, March 10, 2017. The indictment last week of former Donald Trump campaign aide George Papadopoulos, who admitted lying about contacts with Russia during the 2016 U.S. presidential election campaign, is turning the spotlight on London as an important hub of suspected Kremlin meddling in Western politics, say analysts and Western officials. Papadopoulos, who White House spokespeople say was a low-level and unimportant foreign policy adviser in last year’s campaign, was initially introduced to shadowy Russian contacts by a London-based globe-trotting Maltese academic, according to the indictment of Papadopoulos unsealed last week by special counsel Robert Mueller. But the British capital is now featuring more prominently than just the venue of meetings between Papadopoulos and Russian officials. Probes launched on both sides of the Atlantic into suspected Russian subversion of last year’s White House race and the 2016 Brexit referendum are increasingly highlighting the British capital as a hotbed of Russian intelligence activity that links individuals and groups of interest to investigators in Washington as well as in Britain. Political pressure is mounting on the ruling Conservative government of Theresa May to launch a broad formal inquiry into whether Moscow sought to influence the Brexit vote. 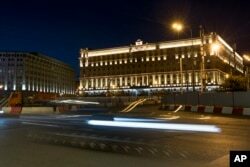 In this photo taken July 24, 2017, a car passes the building of the Federal Security Service (FSB, Soviet KGB successor) in Lubyanskaya Square in Moscow. The demands came as it emerged that three senior past and present Foreign Office ministers, including the current Foreign Secretary Boris Johnson may have been targeted by individuals identified by the FBI last week as central to the Mueller probe. Mueller is investigating Russia's meddling in the U.S. election and accusations of collusion between Trump campaign aides and the Kremlin. The Trump administration has denied there was any collusion. Papadopolous reached a deal last month with Mueller, agreeing to plead guilty to lying to FBI agents about his contacts with Russian intermediaries during the presidential race. 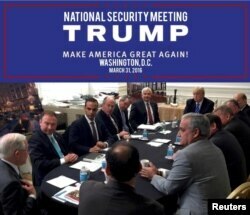 George Papadopoulos (3rd L) appears in a photograph released on Donald Trump's social media accounts with a headline stating that the scene was of his campaign's national security meeting in Washington, D.C., on March 31, 2016 and published April 1, 2016. According to the indictment Papadopoulos was offered “thousands of emails” of “dirt” on Democratic presidential candidate Hillary Clinton in his meetings. Those offers came months before Wikileaks, whose head Julian Assange is based in London, published emails hacked from Democratic Party servers in what U.S. intelligence agencies have assessed as part of an “active measures operation” by Moscow. Britain’s Observer newspaper reported Sunday that Papadopoulos and the Maltese professor, who was not named in the Mueller indictment but was subsequently identified as Joseph Mifsud, had several meetings or encounters with British ministers. As recently as two weeks ago Mifsud reportedly attended a dinner at which Boris Johnson was present and was the guest speaker. Foreign Office officials have told the British press that Johnson did not “knowingly” speak with Mifsud. Before the dinner, the Maltese academic, who has boasted to colleagues he has met Russian leader Vladimir Putin, told friends he planned to raise the current Brexit negotiations with Johnson, according to en email obtained by Byline, an independent news-site. The disclosure about the meetings has prompted opposition party calls for the British government to launch a full-fledged inquiry into Russian intelligence activity. It is adding to growing unease about whether Moscow tried to influence Britain’s 2016 vote to leave the European Union. 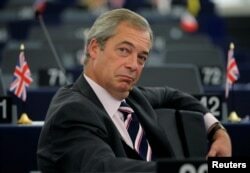 Last week, the Electoral Commission launched a second narrower probe into the source of some of the donations and loans to Farage’s campaign amid allegations by Labour lawmaker and former minister Ben Bradshaw that the funds may have been “dark money” channeled to disguise its origin. The denial is not quieting a mounting chorus in Britain’s Parliament for a bigger investigation. Tom Brake, a Liberal Democrat lawmaker, is also urging a formal inquiry, citing “concerns emerging about possible Russian interference in the EU referendum. British election officials say they are talking also with social media companies to establish whether Russian agencies may have used Facebook and Twitter to try to influence the Brexit vote in much the same way investigators allege they attempted to do in the U.S. election last year.